If you want to modify a set of members across all your WiscLists or ClassLists, you can do so through WiscList Admin. 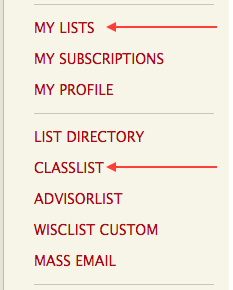 Log into WiscList and navigate to either the My Lists page or Classlist page to modify members in WiscLists or Classlists, respectively. In the field next to “Search List Members,” enter a search phrase to find the members you would like to modify. You can search by name or email address in this field. Select the checkbox(es) next to the settings you would like to modify for ALL members you specified above. Once you are satisfied with your choices, click “Save Changes” to apply the changes to all the members.